Being homebound is not easy – it can lead to feelings of isolation and loneliness that may have a negative impact on one’s emotional, mental, and even physical health. At Dependable Community Home Care, this is something that we wish to prevent and this is why we offer our Companionship services. 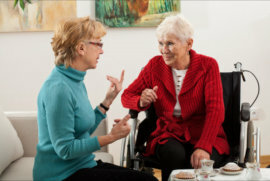 Our compassionate caregivers can offer Companionship that entails lively conversation, assistance with recreational activities, daily exercise, accompaniment on walks, watching TV and movies, playing board games, and more! If you wish to know more about this service, please don’t hesitate to give us a call at 302-525-6911 for more information.